First of all, merry Christmas to everyone! I hope everything is going well and you all are having nice days. While starting my latest project, I still had some other things that needed closure. One of them, of the most recents in fact, was the 'Scythe' boardgame (you read about it a couple of weeks ago). My mate (owner of the game) scheduled another game for these days wit more people and of course my reaction was as expected; I can barely bear playing a game with unpainted minis. Twice... oh, man, you're asking for too much. So I could have declined the offer (and no one could blame me) or I could be reasonable and do the only logical thing... i.e., painting those minis before the game. I'm not really a fan of colouring the bases, but it was the easiest way to recognize each faction. Not sure if I'll repeat the system for other games (unlikely), but I was worth of giving a try. Well, I was in a little rush, but I work fine under pressure :D. It was kind of like the old times, hehe. 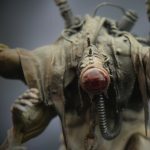 You may have noticed my painting rate (and with it my blogging/forum/etc. activity) has decreased this year. That's due to RealLifetm commitments (working, parenting, writing the [censored] PhD thesis, stuff, generic excuse #6, you know). Next year will most likely unwrap itself in the same fashion, but you can see I'm still riding the wave. So see you on '17! All the best for the New Year, mates! Cheers! For a start I chose all the winged creatures. Lots of tiny models, but they would be fine to warm up the brushes and get into the mood. We agreed that an 'Avatar' approach would suit the minis. You can say a lot of things about that movie, but the design of the animals and stuff is certainly inspiring. So let's get started! Avatar themed then. That means colour splash. Epileptic seizure would be too extreme maybe, but I could stay just one step behind that. Avatar uses a predominant cold palette for all the creatures (but for the giant flying thing), so I stayed close to that, though I added a few warm colours to some of them; some variety seemed more pleasant to my eye. I had terrible problems for the next stage. I committed myself to paint each one of them in a different way, and hard into the epileptic concept, with flamboyant patterns and gaudy colours all over. That went terribly wrong. It simply didn't work. From parrot-like schemes to WWII planes cammo, I made every kind of stupid mistake imaginable. So I had to go back to square 1 again, breathe and begin all over. I had to see them not as individuals, but as swarms. Each model didn't have to incorporate twenty different colours, but just one predominant colour with patterns or whatever. I left the Avatar stuff aside and begun to google actual Amazonian frogs, lizards and whatever I could find. Then I saw it, oh, wise Mother Nature, you had it there for me to see and get inspiration. I came to the conclusion of leaving just one main colour for the body, light beige for the belly and lower membranes and darker tones of the main colour for the back. I dared to do different patterns here with more colours. These were the things that didn't work on a smaller scale, but looked better when at this size. So this was it. The rest was just about the bases. On the whole I must say that the real stuff proved to be more inspirational than the movie concept arts, which is quite unexpected. I'll dig in on that way for future references, but for the moment these are quite a start for the project. A quick break today until I start new projects. I had this Obi Wan Kenobi from KnightModels awaiting for some months. I made a quick job on the mini, one of these things you need to do to take some fresh air and get the feeling of doing actual progress on something. Pretty straightforward paintjob, standard colours and a little mandatory OSL for the lightsaber. I should take more risks and make more (and larger) layers. For now this is it. It's not the first time I paint an Obi Wan, some years ago I showed the 72mm Kenobi, also from Knightmodels. I solemnly regret not hoarding the whole 30mm ranges when KnightModels released them, but I didn't expect them to drop the license so abruptly. Finding these minis (for a reasonable price) today is quite a challenge, but I take a look on the internet from time to time. They are totally into the same scale, so it's a deal. That's another reason why I took this quick paintjob on the mini (one night's work), I was thinking more in having a tabletop ready mini than any other thing. I know some people playing the old WEG game, so I'm in fact curious about the possibilities. Shamefully the old 25mm minis don't match these new 30mm ones (or the other way back, you know), but anyway I'd like to have a look at the game and run a few skirmishes. I recently got the chance to have a game of this recently successfully KS-ed 'Scythe'. The setting is quite unusual, and that's appealing itself. It's some kind of weird war in the 1920's Eastern Europe. The factions in fact are the Polania Republic, the Rusviet Union, the Crimean Khanate... You get this, add Mechs and... what could possibly go wrong? So, what's this all about? You will have to conquer (and retain!) several territories in order to get control of their natural resources, which will allow you to build stuff, improve your forces, etc. You will move your workers and your special character along the board; if you are successful, you may deploy more workers or even military units, i.e., mechs. Depending on your actions, you will increase factors like your Power (military power), your Popularity or, well, your money! These things are important as you will have to meet some requirements to complete missions or to fulfil some objectives (e.g., complete all your possible upgrades, deploy all 4 mechs, build all 4 buildings, have 18 popularity...). When any of the players fulfils six objectives, the game ends and the player with the greatest fortune wins the war, having obtained the most profitable situation from the new peace settings. Let's have a look at the reference cards. Be aware they look complex on a first view, but once you get the baiscs it's no big deal at all. You will have a faction mat with the specifics of your unique skills. Besides, you'll have a player mat, randomly assigned, in which your production requirements are explained. This system avoids repetition, as a single faction can receive different player mats in different games, making each game different even if you play the same guys. In the upper pic you can see what I mean. The upper mat is about the Nordic Kingdom. You can see my Mechs ready to be deployed and my special stuff. Below, the player mat, different every game. This settles which actions will I be able to perform each turn and the related costs for upgrading/building/whatever. The more you upgrade, the cheaper will other stuff become. Workers can collect resources depending on the territory (wood, oil, metal... even more workers on villages). Mechs can combat and characters can combat and perform special actions. Best way to explain is playing. Let's go. When you have enough resources, you can produce a mech. Not only the mech is a miltary unit that can conquer territories (disbanding enemy workers given the case), but it also unlocks special features. So you may want to think which mech you deploy first, as each one provides different stuff for the cause. "Have 3 or less popularity, at least 13 power, and at least 2 mechs". Sooo. Popularity: Check. Power: Check. Produce a second mech... Check. Mission accomplished. 1 out of 6 goals. To victory! Combat depends on no dice rolls. It's all strategy and resource allocation, just like the rest of the game. Each player has a combat card (randomly taken from the card deck) with a value on it. When fighting, both players use a dial with scores from 0 to 7. Those are the Power points you are willing to use in the combat. You may want to add the points from the combat card. That's it. Both players reveal their points and the higher score wins. Second star for the blue team! Blue victory, sixt star positioned, the game ends! I'd like to state some things at this point. Don't get the wrong impression at all, the game was quite balanced the whole way from the beginning to the end. Both of us could have achieved the goals, but I was rather focused on getting one done before I went for another. My pal was on the edge of getting a few of them, and he would most probably have two or three done in a couple of turns more. However, seeing your rival getting stars adds serious pressure and might lead you to rushing and losing the point. Anyway, the object of the game is not only winning stars. Besides, we both had to check our money, the territories under control and the resources we each owned. The victory was for the Nordic Kingdom in the end, so the Vikings from ther distant North set their rule over the Tartars of Crimea! Exhilarating game. That's how I'd define this. Scythe is quite different from the other board games we regularly play. You could say it's clearly an Eurogame, of course everything was decided on resources and the way of managing them. Right. But there's something about it that makes the difference. It may be the ambientation or more likely the confrontation style, but this more like a combat Catan. You have to take different factors under consideration, like the popularity or the size of your military forces. It's not just a matter of 'having this gives me that', there's much more depth here (for example, having the full worker force helps you to collect resources, but moving them all to the proper places is a logistic nightmare, and an overpopulation of workers will for sure affect your popularity and make some other endeavours more difficult). I havent told about the 'Encounters' system, special events happening when your character gets on certain tiles. Another way of adding colourful stuff to the way of developing your strategy. We didn't get to control the central tile of the board, the ominous Factory. It apparently has some particularly tasty effects on the balance of the game.